The Equilibrium Of Reservoir Fluids As crude oil is extracted from a formation and the pressure of the produced crude drops below its bubble point, some portion of the liquid will flash into the gas phase resulting in a two-phase mixture. This liquid and gas mixture is typically sent through multistage separation to divide the gases from the liquids at decreasing pressures. To improve product separation and recovery at minimum cost, operators need an understanding of the reservoir fluids’ behavior under the operational temperature and pressure of each separator. The Model 2353 Equilibrium Flash Separator tests reservoir fluids to measure gas-oil ratios, formation volume factor, stock tank vapors, and residual oil gravity as a function of separator pressure and temperature. The instrument permits gas-oil ratio and shrinkage determinations by the flash liberation or vaporization methods. This information allows for the determination of optimum separator conditions. 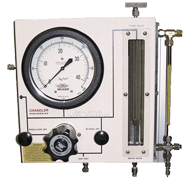 The Model 2353 consists of a 1st-stage separator chamber, equipped with a micrometer needle valve inlet, and a drain valve leading to a 2nd-stage receiver tube. The 1st-stage chamber, with a volume of 30 ml, is connected through stainless steel tubing and fittings to a pressure gauge and a back-pressure regulator (which can be isolated with a cut-off valve) to control the separator pressure. The entire pressure system is isolated from the atmosphere by an additional valve. Both the 1st-stage separator chamber and the 2nd-stage receiver tube are graduated, to allow manual measurements of the liquid volumes.